Markine Ostling, owner of the Little Switzerland Post Office building, with “North Carolina Bear Paw,” the latest quilt block added to the Quilt Trails of Western North Carolina. 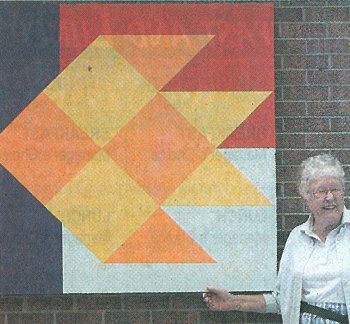 The quilt block, a bear paw atop the N.C. state flag, was designed and painted by Betty Altman. The design was inspired by Little Switzerland Postmaster Jean Law’s bear collection on display inside the post office.